Why do some people believe that God is only an idea? How can you combat the naturalistic worldview promoted by the great universities and the influence of popular culture that declares, "God may exist, but who cares?" How can you evangelize an unbelieving world? 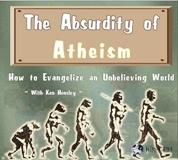 In the enlightening three CD series, The Absurdity of Atheism, Catholic convert Ken Hensley reduces to absurdity the notion that there is no God. In fact, you'll learn how atheism as a world-view cannot be true because it inevitably leads to contradictions that even atheists can't live with! You'll be able to prove why unbelief inevitably leads to the destruction of morality, meaning, and even knowledge! Scott Hahn calls Ken Hensley "a great student of God's word and a really gifted teacher." Order The Absurdity of Atheism today and you'll be empowered to "turn the tables" on unbelievers by conclusively demonstrating the utter foolishness of atheism.